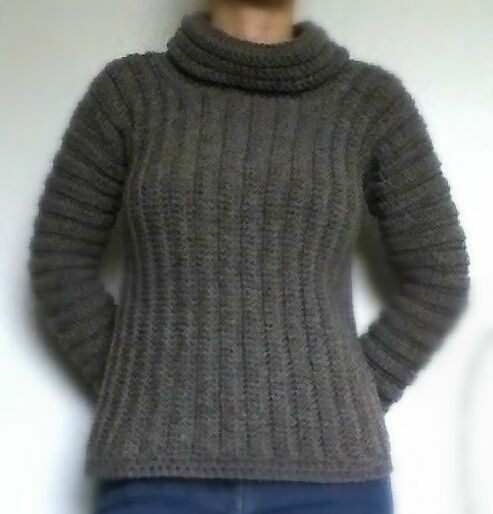 Ok…so I was inspired by Lionbrand’s Side-to-side Cowl Neck Sweater pattern (http://www.lionbrand.com/patterns/70210A.html) but the acrylic wooI I was using made the cowl neck feel like wearing a tyre so I frogged it. I liked the idea of crocheting the vertical ribs and making the front and back as one piece so I did my own thing. It worked out like a rectangle with a hole in the middle for your head, then joined under each armpit down to the hip. The arms were worked in joined rounds like the pattern and the neck was done in the same principle, changing to a bigger hook as the neck got longer so that it folded over comfortably. Also, I used trebles (UK) rather than half trebles so my wool went a bit further! Another pattern successfully not stuck to!